T he Chancellor’s response to the £1.1bn windfall handed to him by the fine on the banks is a classic in Osborne double-speak. We’re told the money will be “used for the wider public good”. He means tax cuts as an electoral bribe. He says “today we take action to clean up corruption by a few so that we have a financial system that works for everyone”. Today? Why not when the corrupt manipulation of the £3.5 trillion a day foreign exchange markets was uncovered years ago? “Taken action to clean up corruption”? – almost nothing has been done to prevent another banking crash and the foreign exchange market remains, breathtakingly, unregulated. “Corruption by a few”? – the truth is the whole industry was (and still largely is) rotten to the core as the chatroom exchanges between the traders of all the main banks clearly reveal. “A financial system that works for everyone”? – one can only wonder at Osborne’s gall in spitting out a lie with such bravado, which he knows is a lie, and probably knows too that everyone else knows it’s a lie. The bankers’ bonuses, overseas speculation, contrived tax avoidance, and mortgaging of prime property in central London works works in no-one’s interests except their own. But the Chancellor hadn’t finished the stream of untruth. He went on: “It’s part of a long-term plan that is fixing what went wrong in Britain’s banks and our economy”. Part of a long-term plan? – in that case why is the deficit this year about £100bn instead of the £40bn he predicted in 2010? Fixing what went wrong in Britain’s banks? – what went wrong, among repeated acts of criminality, was the repeal of the Glass-Steagall Act which severed investment (casino) banking from retail banking, and which Osborne himself has latterly refused to put right. Fixing what went wrong in our economy? – what went wrong was the bankers’ ramp which Osborne then massively exacerbated by deploying the dead hand of austerity to deal with the deficit rather than stimulating the economy to pay down the deficit much faster through growth. No doubt he’ll us in the same vein in the Autumn Statement on 3 December that he’s using the £1bn windfall, or other unfunded giveaways, to plough back increased resources into the NHS, without mentioning that he’s stolen £20bn in cuts out of the NHS in the last 5 years. And no doubt too he’ll tell us that he’s getting tough on the hated bankers even though none of them are being sent to prison for embezzlement and misfeasance on a industrial scale, yet more than a million poor and disabled persons have been sanctioned (i.e. had all their income taken away) for trivial infringements not a billionth the size of the bankers’ corruption. 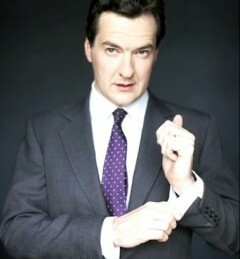 But then, that’s Osborne for you, through and through. Posted in: Conservatives, Economy, Finance, Politics. Yes bankers bonuses are back to £3b. Lat year 2,714 bankers earned 1m euros each and for example Barclays gave 315 senior managers a £1m bonus each. What would happen to you if you were responsible for a budget and it reduced by £10b? Yes like reg CEO of Royal Dutch Shell in the first quarter last year you would get a £2.6m bonus. As some working people struggle to pay the bedroom tax or live on zero hours or do unpaid workfare isn’t it funny that we don’t hear WE ARE ALL IN IT TOGETHER anymore. It’s amazing what you can learn when you start reading the financial pages of Friday’s Guardian and sometimes The Times (a free edition in a pub) you see the rich and powerful in heir parallel universe! But of course the bonus culture went wild on a Thatcher and then New labour watch, New labour only decided to attack the bankers when the press did and the public responded but it was way to late. Labour did not mind people getting rich so long as they did not doing anything wrong to mess up an election but sadly they did and the explosion happened on a labour watch. The Tories are now the evil party not long ago it was New labour or as we all know them the labour party, most of those that now moan about Blair backed him to the hilt. Some on the left fell for his wars and his attack on the sick the disabled and I cannot forget that Labour put the 1% rich people back at the top richest list and the poorest down into poverty. I’m not sure labour would have done a sodding thing different and if your retired not working sick or disabled then voting labour sadly is not the answer they cannot even speak to us all you get from the Progress party is hard working, then cannot mention socialism or socialist not even social housing all you get is the progress affordable housing. Freud is an ex banker brought in by labour now he’s gone to the Tories labour hate him why he’s doing what labour wanted him to do. How many bankers went to Jail under labour the party who bailed the banks out yet did sod all to control the bonus culture . Why would anyone who is not working vote labour. Just been to an excellent talk by Owen Jones in Leeds with about 250 people despite the Chair being a control freak & choosing the questions when the Left should learn we should have free flowing discussions. I wanted to say the Left needs to be better re propaganda – the Tories have been given £50m by Hedge Funds since the General Election and this April with Lib Dem support gave a tax cut of £145m to Hedge Funds and we should shout it from the roof tops! As Dr Ha Joon Chang also argued we should read the financial pages of the quality papers like The Guardian every Friday to empower ourselves as economically aware citizens. Streekt in New Left Review argues the rich and powerful haven’t a clue what to do about the global financial crisis and quantitative easing has only put it off for a few years. As well as corporate debt being unsustainable so is personal debt and Neo-Liberalism’s Acihilles Heel is its drive for cheap labour which restricts the ability of working people to purchase commodities. The strength of capitalism and Neo-Loberalism is that it is international and our weakness is we are bloody not! We should campaign locally & nationally and with our sister parties internationally for a global living wage, shorter working week, a global decent homes programme, global public ownership by country, global decent health services, global better health & safety at work, global sanitation – we solve the global financial crisis by intervening and meeting global need for example we could make toilets for the 2.5b who don’t have Access to them. Imagine if in every country in the World democratic socialists were campaigning for similar aims – the rich and powerful wouldn’t know what had it them. Yours in peace, hope & international solidarity! The Tories and hedge funds we should not have been shocked should we. The shock was Miliband and Progress attacking the Unions, the attack was you can go but we will keep the money your paid by labour party members because it’s ours. I mean it did not dawn on the labour party that the Unions could have said tell you what the political levy is not working we will dump it. Turns out that labour has less members in the Unions then it does on it’s own books it’s less then 100,000 members which is shockingly low and would have given labour £300,000 not the £8 million it has now. This was the surprise that Miliband was so weak he was that easily taken in by Progress and Blair and willing to throw away millions to allow Progress to put in place it’s own MP’s. That is what shocked me not that the Tories getting millions from hedge funds. Owen of course speaks as a socialist sadly they are getting pretty rare these days, he speaks about the working class not hard working.